It won't have escaped your attention that AMD rolled out new-and-improved Ryzen Threadripper chips on Monday. The chief performance protagonist, 2990WX, houses 32 cores and 64 threads, and such horsepower demolishes CPU-centric benchmarks that can scale well. Workstation applications in particular benefit from the massive thread count and, as we mentioned in our conclusion, 'doubling the cores and threads leads to predictably gargantuan performance that puts AMD in a different HEDT league to Intel'. As massive as the multi-core potential is, 2990WX's potential is fundamentally stifled in gaming - though would you really use it for that? - so much so that some of the latest titles are verging on unplayable without having to resort to rebooting in a specific Game Mode. We can look past this problem because it's ostensibly a workstation chip above all else. Anyone wanting a more well-rounded solution needs to look further down the Ryzen Threadripper stack, to the X-series chips. This is why the 2950X, also released on Monday but on-shelf August 31, appears to be a better bet. Using the same 16 cores and 32 threads as last-gen 1950X, minor clock-speed hikes ought to ensure it's a better fit for the power user who likes unfettered access to gaming. This new chip is simpler to comprehend than the 2990WX because it is largely based on an existing design. You see, 2950X does indeed share the same core, thread, TDP, L3 cache, PCIe laneage and package support as incumbent 1950X, so it's easier to describe the differences than explain similarities. Being a 2000-series processor endows it with a plethora of improvements that we have discussed previously. Chief amongst them is a move to a 12nm process - helping the frequency/voltage curve - addition of Precision Boost 2 and Precision Boost Overdrive, as well as official support for faster DDR4 memory. The sum of these benefits are two-fold. Firstly, AMD is able to hike the base and boost speeds over the previous generation without tampering with the thermal power. A 3.5/4.4GHz base and boost compares rather nicely against the 3.4/4.0GHz on first-gen 1950X. Secondly, the provision for Precision Boost 2 ought to ensure the 2950X remains closer to its peak speed for longer, irrespective of the number of threads tasked. One would expect the 2950X to be around five per cent faster than 1950X in most benchmarks, depending upon how good the cooling setup is. That's a nice little step up the performance ladder which is made all the more palatable by a drop in the official price from last year's $999 to $899. Such financial outlay puts it below the 10-core, 20-thread Intel Core i9-7900X that retails closer to a grand. 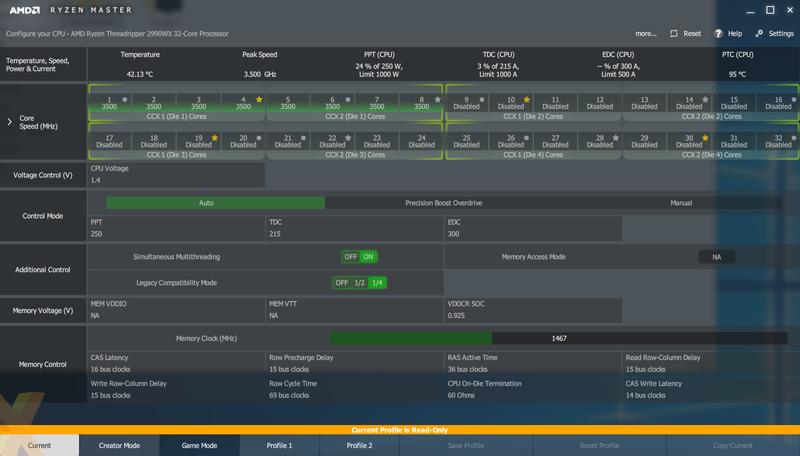 As usual, the AMD argument is one of more cores and threads at a lower price, plus the benefit of upgrading to the monster 2990WX if budget permits at a later date. Though not reviewed here, AMD is also introducing a relatively budget 12-core, 24 thread Ryzen Threadripper 2920X in October, whose $649 asking fee is some way below the $799 previously charged for the similar, but slower, 1920X. 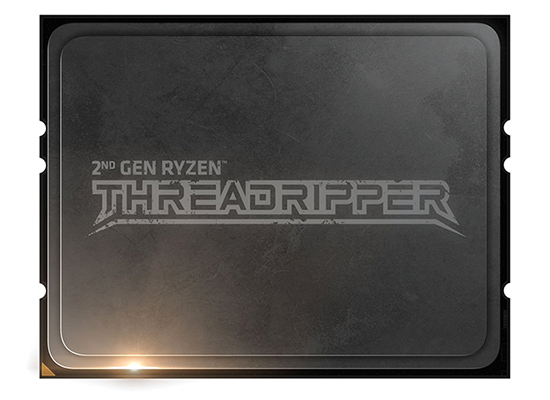 Second-generaton Threadripper X offers more performance for less money. Never a bad thing. Ryzen Threadripper 2950X straddles the line between power and professional workstation users. It needs to be really good in multi-core apps, offer solid low-thread performance, whilst also making a good fist of gaming. Quite a wish list, so without further ado, let's see how it copes with these three eclectic workloads.